Moscow, which in 2017 celebrates its 870th birthday, is the symbolic heart and soul of Russia. A sightseeing tour of this great city begins at Red Square with its iconic St. Basil's Cathedral and the massive red walls of the Kremlin. Visit inside the Armory Museum, see Moscow University and the Old Arbat shopping district. Then drive along the wide boulevards and stroll through GUM, Russia's largest department store. The balance of the day is free for independent activities. After breakfast, travel 75 km north east of Moscow to Sergiev Posad, a powerhouse of Ancient Russ, one of the oldest seats of Russian Orthodox Church and still among the most important pilgrimage centers in the country. Simply put, Sergiev Posad is Russian Orthodox equivalent of the Vatikan. For centuries, the monastery served as a Spiritual centre of the Russian Orthodox Church and the place of pilgrimage. You will be taken for an in-depth tour of the Monastery. Inside you will see many fascinating treasures including the icons that belong to the brush of Andrei Roublyov, the founder of the Russian icon painting. You will visit the Trinity Cathedral, Chapel-at-the-Well and the Refectory. 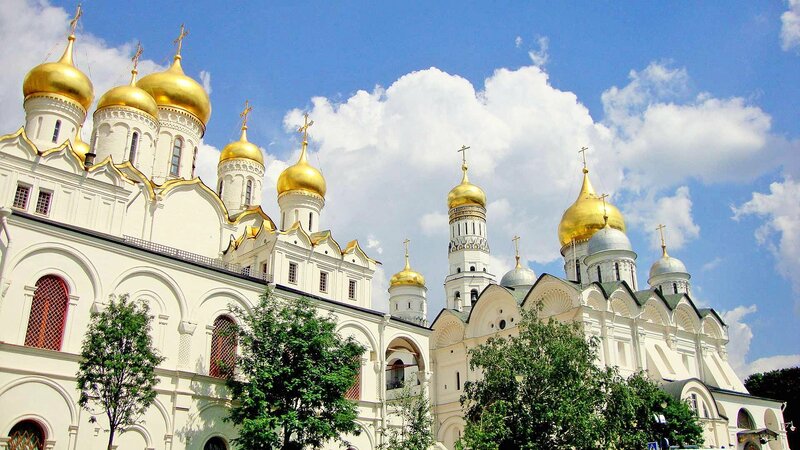 Admire the Russian Orthodox architecture of the Cathedral of the Assumption known for its fairy tale blue-and-gold domes. There aren't many cities in the world that can match the grace and grandeur of St. Petersburg. When Peter the Great founded the city in 1703, he hired Europe's best architects, craftsmen, and artists to build and decorate it. The city is spread over 100 islands and linked by over 600 bridges. It is often called the Venice of the North. In the morning enjoy a tour of the world famous Hermitage which houses many treasures from the Czarist era. After the tour you can stay on inside the museum and explore the museum on your own. Highlight of your stay in St. Petersburg is today's tour of the world-famous Hermitage Museum. It ranks among the largest and oldest museums of the world. Admire the wold famous masterpieces by Leonardo de Vinci, Rafael, Titian, Rembrandt, El Greco, Velasquez, Rubens, Van Dyck, Goya, and the French Impressionists. Be prepared for a lot of walking. The 700-year-old capital of Poland has been called the city of Phoenix as it revived after almost a complete destruction during World War II. Your Sightseeing tour of Warsaw includes a drive along the famous Royal Route from superb Castle Square to Lazienki Park and Palace, the summer residence of the last king of Poland. Then view the Palace of Science and Culture (known as a "wedding cake"), the Saxon Gardens, Tomb of the Unknown Soldier, Monument to the Heroes of the Warsaw Ghetto, and the Barbican. Prague has a long and colorful history, from its early days as a bishopric, to becoming the residence of the Bohemian kings, and later the capital of both Bohemia and the Holy Roman Empire. The city was built across seven hills on both banks of the Vltava River more than 1000 years ago. Today, it is one of the most attractive cities in Europe. Your sightseeing starts with panoramic drive to famous Wenceslas Square, Strahov Stadium, and Castle Square.